Ruby is the July birthstone – and it’s one of the most coveted of gems. The name is derived from the Latin word ruber, meaning “red” – the colour of love and passion. Few things catch the eye like the July birthstone. The finest colour of the birthstone for July is a deep red with a hint of purple, called “pigeon’s blood” in the trade. A variety of the mineral corundum, ruby gets its colour from trace amounts of the element chromium. The more chromium, the stronger the red. Here’s what you need to know about this beautiful July birthstone so you can better choose one for yourself or a loved one who was born in the month of July. In ancient India, ruby was called the “king of precious stones” for its rarity, hardness (second only to diamond), beauty and seemingly mystical powers. Long associated with the life force blood, ruby was a symbol of power and youthful energy in Indian jewellery. In past centuries, some believed this birthstone for July could predict misfortune or danger, and others claimed it would cure inflammatory diseases and soothe anger. Burmese warriors believed it made them invincible in battle. Medieval Europeans maintained that rubies bestowed health, wisdom, wealth and success in love. In addition to being the July birthstone, ruby is traditionally given for the 15th and 40th wedding anniversaries. Our search for the July birthstone starts in Myanmar (formerly known as Burma), one of the oldest recorded sources of fine rubies. For more than five centuries, the Mogok area in Myanmar has produced some of the most sought-after rubies – vibrant red beauties softened by light-scattering inclusions and a glowing red fluorescence. The region is a place of weathered marble and ancient Buddhist temples. Since the late 20th century, Vietnam has been another important source for the July birthstone. 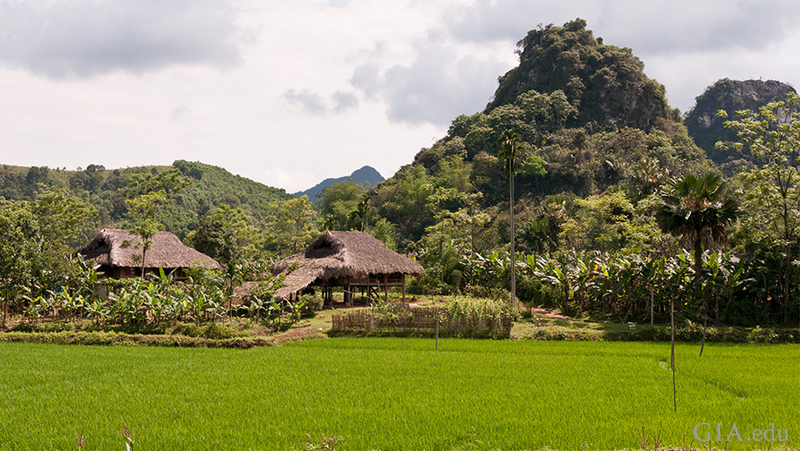 The Luc Yen region in northern Vietnam, where rainforest-clad mountains rise over broad paddy fields, produces rubies of red to purplish red colour. Further south, the Quy Chau district has also yielded many fine rubies. Today, artisanal miners work the soil in the hope of finding a gem that will change their fortunes. Mozambique is an important new source for the July birthstone. This African nation is home to the prolific mines at Montepuez. Rubies found there have been compared to the famed gems of Mogok. For many years in the late 1900s, the ruby deposits along the border between Thailand and Cambodia were the major source of rubies in the marketplace. Other important producers of the July birthstone include Afghanistan, Tajikistan, Pakistan, Sri Lanka, Kenya, Tanzania and Madagascar. Rubies are often heat treated to remove purplish coloration, leaving a purer red. The process can also remove “silk” (minute needle-like inclusions) that can cause a gem to appear lighter in tone and be more opaque. The trade typically accepts heat treatment, as it is stable under normal conditions of wear and care. However, rubies may also be subjected to lattice diffusion treatment and dyeing. In lower-quality material, surface-reaching fractures and cavities may be filled with a glass to decrease their visibility so the gem appears more transparent. Some of these treatments may make the ruby more vulnerable to damage during normal wear and care. Before you buy, always ask if your ruby has been treated and by what method. The US Federal Trade Commission requires the disclosure of treatments that affect a gemstone’s perceived value. A GIA Identification Report is important in identifying if a stone is natural or synthetic and whether it has been treated in any fashion. In most cases, the July birthstone can be safely cleaned with warm soapy water and a soft brush. Ultrasonic and steam cleaners are usually safe for untreated, heat-treated and lattice diffusion–treated stones. Glass-filled or dyed stones should only be cleaned with a damp cloth. Whether or not you have a July birthstone, owning a beautiful ruby is a rare and precious thing. 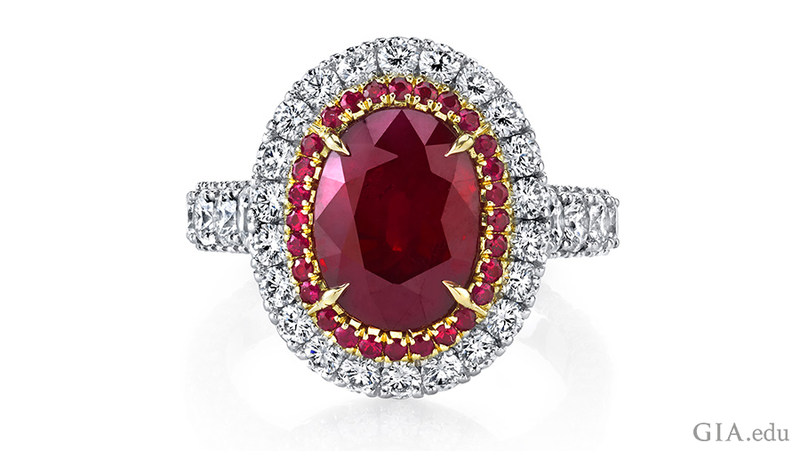 And if you love red gems in general, check out our Ruby Buyer's Guide.